The 115m ² apartment is a separate house on the property of the landlord. In the lower floor of the apartment there is the living room with TV & DVD player, a fully equipped kitchenette with a hob, oven, refrigerator, microwave, kettle, toaster etc and two bathrooms each with toilet, vanity and shower and in the upper floor a toilet with vanity. The bedroom is equipped with a box spring bed (180x200, separate mattresses) and a single bed (90x200). The second bedroom has 3 upholstered loungers (90x200). The bedrooms and a guest toilet are located upstairs, which is accessible via a steep space-saving staircase. In addition to the apartment is a separate seating area in the garden with barbecue and garden furniture available. 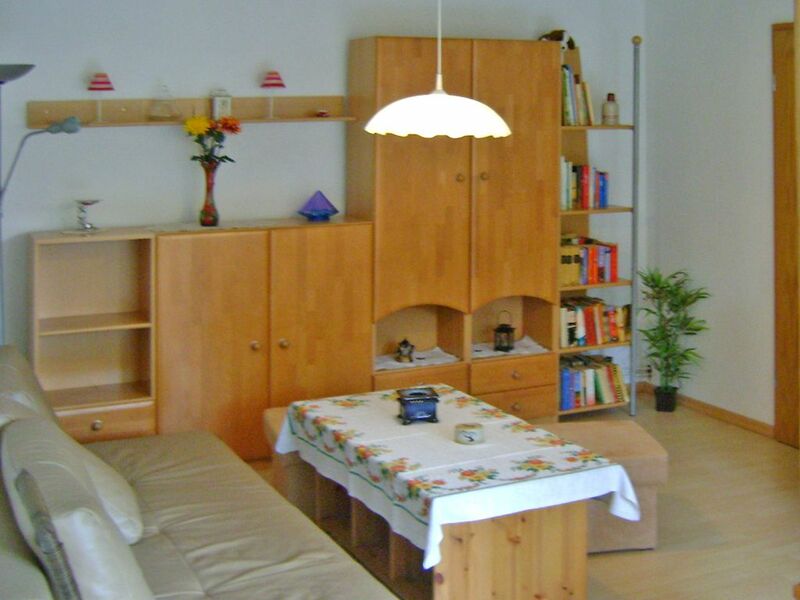 The apartment "Mirada" in the small town Blankenhagen was prepared for you so you can relax and enjoy your holiday. The small town Blankenhagen between Rostock (20 km) and Ribnitz-Damgarten (11 km) in the midst of the Rostock heath. Here you will find peace and relaxation. By carport where you can park, you reach the apartment across the courtyard. The 115m² large apartment is a separate house on the property of the owner. In the lower floor of the apartment there is the living room with TV & DVD player, a fully equipped kitchenette with a hob, oven, refrigerator, microwave, kettle, toaster etc and two bathrooms each with toilet, vanity and shower and in the upper floor a toilet with vanity. The two bedrooms with 3 Sleeps (1 franz. Bed, 3 single beds, 1 sofa bed) and a guest toilet are located upstairs, which is accessible via a steep room divider. In addition to the apartment is a separate seating area in the garden with barbecue and garden furniture available. Große Wohnung, Küche sehr gut ausgestattet. WLAN vorhanden. Wir haben während unseres Aufenthaltes nichts vermisst. The small town Blankenhagen between Rostock (20 km) and Ribnitz-Damgarten (11 km) in the midst of the Rostock heath. In Blankenhagen there is a bakery, two beverage stores, a dentist, a general practitioner, a hairdresser, a beautician and a car repair shop. By bike you reach z. B. to Karl's strawberry and Erlebnishof or Ausflugsgaststätte Schnattermann. Other nearby beaches to Darß, Graal Müritz or Hohe Dune / Warnemünde takes about 15 minutes (17 km).